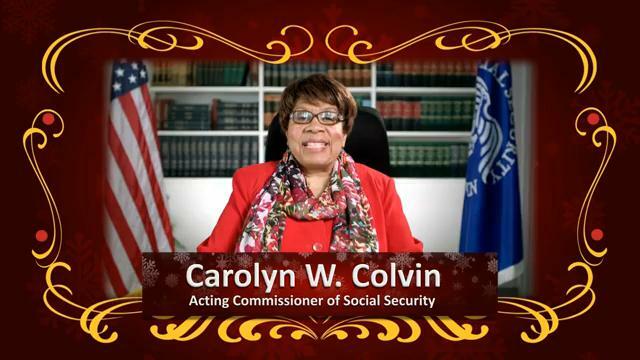 Click on the picture above to watch Acting Commissioner Carolyn W. Colvin’s holiday message. This entry was posted in Uncategorized and tagged Happy Holidays by Carolyn Colvin, Acting Commissioner of Social Security. Bookmark the permalink. No presents (entitlements) for the elderly and no COLA for retired military is a double whammy for me. Almost like a Christmas tree without presents for the kids. Thanks to the White House our bumps are going to all the immigrants flooding the USA be they legal or otherwise. We can’t even feed our own. Why are we allowing I migrants in and feed and take care of them.I know hungry people. I want our government to TAKE CARE OF US……FIRST!!!! We need more inihgsts like this in this thread. While it is not the govt job to take care of us legal or otherwise, it is our job to care for one another. Merry Christmas. We are making due with what we have and thankfully blessed. Hope you are too. While our govt stands vigilantly overseeing our country’s national security. Charity should start at home, Its not right the way our Gov. treats us , but of course the politicians have more than they need. To everyone who Is trying sooo hard, Merry Christmas and a Happy New Year. I would like to thank you for taking a day to wish everyone a year’s worth of Holiday greetings but you forgot this was the Christmas season. So “Merry Christmas” to you! You must understand that we need for your Administration to stop the robbing of our retirement accounts. You are just as responsible as the White House. Return the monies you have allowed to be stolen for at least the last 7 years. No Increase on Social security for Retirees! Madicaid,some have more in Compesations,than many average America’s,That work hard almost all their life! Sadly,we promote dependency,for many who do not need it.not those who deserve it! THE GOVERNMENT SPENDS MONEY ON WORTHLESS THINGS – THEY SPEND MONEY ON FOREIGN ENTERPRISES – THAT IS NOT RIGHT – WHEN OUR GOVERNMENT CAN’T CARE TAKE OF RETIREES IN THE UNITED STATES SOMETHING IS DRASTICALLY WRONG – I AM SURE THAT MY WORDS FALL ON DEAF POLITICIAN EARS – MAYBE ONE DAY THE WRONG WILL BE MADE RIGHT…. Why does this have to be the ONLY reilable source? Oh well, gj! May there be peace on earth and may you all have a blessed Holiday. Thank you to everyone who makes this world beautiful! Happy holidays to every one. Hi, I just hopped over to your website via StUmbleupon. Not somthing I might typically read, but I appreciated your views none the less. Thanks for creating some thing worthy of reading. Over in San Antonio, TX. there’s this place that’s called ” HAVEN FOR HOPE”, well….. I know for a fact that there is still about 800, to 1200 people that are HOMELESS, and….. are still at that place. Especially the area that’s called the: PCY COURT YARD. The people there actually sleep outside, even when the temperature is 42 degrees. And…. for breakfast, and… lunch, they don’t feed you enough, that U R still hungry by 9a.m. or 10:00 a.m., and….. the people that actually have access to your belongings, they go thrrough your stuff. Somebody there had broke into a persons belongings, and…. stoled there socks, underwear, and… there hygiene stuff. Our tax money should be put into building more homes for the homeless people, and.. all the people with low income should also recieve $ 200.00 in foodstamps per month, even if there income is $ 1200.00 per month. There’s alot of homeless people at the library downtown wearing the same clothes, and…. they are HUNGRY. Merry Christmas and Hope for a Happy and SAFE New Year! I am 71 years old and still need to work to support myself. I have worked all my life and have paid into this SS fund all these years. No shame in working so why don’t the politicians get more people out there to working? Its free this and free that for people who can go out and get a job. Wake up America! If you are reading Mrs. Colvin’s message, then you are an SSA employee who should be grateful to even have a job. We are blessed to be living in the greatest country in the world ! Although we may not be doing the BEST that we can for our workers and citizens we are amongst the richest citizens in the world. I am an educated, disabled Vet working in a temp position. Although I am not a permanent employee I am grateful to even have a job. I am proud of have served and will never trash and wish harm on our President and political leaders. I will pray for them and will do the very best in the position that I have. God Bless America and it’s leaders. God Bless You Mrs. Colvin. Wishing you, your family and all of SSA a very Merry Christmas and a very Prosperous New Year. Thank you for your message and well wishes. Hey people- how do you think all these new voters can be attracted to the Democrat party if all this free stuff- EBT cards, free cell phones, isn’t given up for everyone?And only 250 minutes a month of phone service! HOW MEAN AND CHEAP! Surely we should give all what others work for. Don’t yah know everyone deserves cell phone service? And SNAP program benefits!? This year January 3 falls on a Sunday, when that happens they usually disbursement happens on Friday (January 1st). Anyone care to guess when we get our checks? Hi Christie. If your regular payment date falls on a Saturday, Sunday or federal holiday, we send your benefits the business day before your due date. For future pay dates, you may find our Schedule of Social Security Payments useful. I’m still mulling over how to do this. There are quite a few posts on Twitter about it. For me, the main thing is to have staff ready to discuss as opposed to me just standing and talking, but without adding extra time to their reeionspbilitiss. I know times are ruff even getting disability benefits but at lease we are getting something, tight now its the 23rd of December and i am making my last box of spaghetti after this its off to the pantries until i get my check , No Christmas This year. Merry Christmas Mrs. Colvin. I also hope you have a Happy New Year. I have enjoyed working under your leadership and you are an inspiration. Take Care, I hope to meet you one day. with more 65 years old, and disability too. The health care it very important for everybody too. It’s more important to report the possible fraud of the companies that have contract with the federal agencies in order to have the legality in it. As two retired Professors of Soviology, we are well aware that yours is an agency most retirees and the disabled depend on to be there for us. Our country’s Soial Security program is a life line to many of our Senior Citizens and for younger folks too, as you serve those with disabilities. We are indeed grateful for your service to our government and to our country’s citizens! Thank you for being a stalwart publicagency Who is there for so many of our citizens! Where do I mail the application for Plan B, and the Voluntary withholding forms? Hello Pamela. Some people get Medicare Part A (Hospital Insurance) and Medicare Part B (Medical Insurance) automatically and other people have to sign up for it. In most cases, it depends on whether you’re getting Social Security benefits. Most people should enroll in Medicare Part B when they’re first eligible, but some people may choose to delay Medicare Part B in certain cases. Click here to learn more. For additional information, see http://www.Medicare.gov. If you want to change or stop your withholding, go to our Benefits Planner – Withholding Income Tax From Your Social Security Benefits. Thanks!